First blog post of 2008! Sorry for such a late entry as I was in Taipei during the New Year countdown and was only back a couple of days ago. So, first off, a Happy New Year to all! While in SG, you would have known where the fireworks would be. Hence, you will have time to look for vantage points and be prepared. You have to be early at the best viewing place; however, we all know we can't plant ourselves at the spot 3 hrs in advance because, well, we are sightseeing somewhere! a) Bring a compact portable tabletop tripod in your travels like the Ultrapod or Gorillapod. 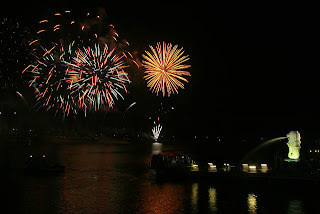 b) A compact camera (point & shoot even) can take fireworks as well. Just use the timer mode, and it works really well with the compact tripod mentioned in (a). The above fireworks is taken with a Ricoh Caplio compact camera! Set to 2sec timer setting for faster firing. Then its a matter of anticipating the fireworks. c) If you arrive at a destination in the day, where you know there'll be fireworks, then try to incorporate your recce in your sightseeing. 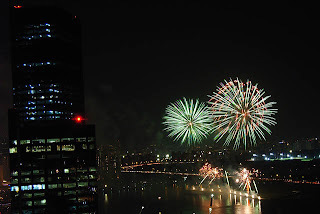 Fireworks, of course, are fired at night, so in the day, go around and see which spots are suitable. d) Better still, if you can afford a hotel room with a view, then you can shoot/see the fireworks from the comfort of your room! Eg. in Disneyland, there are hotels that afford fireworks view, which are fired every night! 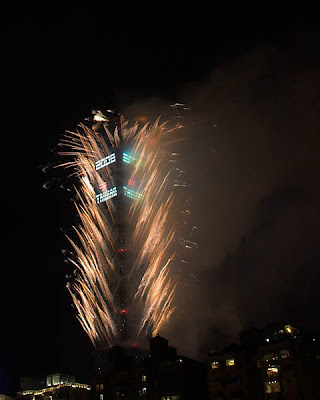 My year end trip to Taipei of course allowed me to see/shoot the countdown fireworks at Taipei 101. So here's wishing everyone a Happy New Year again!